Renault Master 2010 On (All Models) Power Steering Rack Own Unit Repair / Remanufacturing Service. 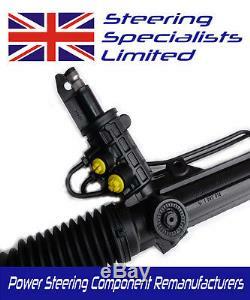 We simply arrange our courier to collect your faulty steering rack Free in the UK Mainland (excluding Scottish Highlands & Northern Ireland) recondition it and then send it back to you good as new! If time is an issue we have a stock of Remanufactured steering racks on the shelf please call to discuss further. We also offer a full fitting service onsite. All work is carried out by. Please call for a competitive quote. Steering Specialists Limited have over 25 years of experience within the Power Steering sector of the Motor Industry and are able to offer for sale. Our aim is to provide our customers with a first class product backed up by a first class service. To achieve this we will guarantee to. Never supply any imported product. As we believe this to be of poor quality and potentially costly to the customer. We will also never supply new imported replica units described as Remanufactured. Using genuine OE parts, our units are tested using Hi-tech modern equipment, beyond any normal operating levels to ensure we are able to supply a high quality product to our customers. Our confidence in this procedure allows us to offer a. Mon - Fri 08.00 - 17.00. Sat 08.00 - 12.00. (Out of hours collections available by appointment). Monday to Thursday will be dispatched for next day. Orders placed on Friday before. Will be dispatched for arrival the following Monday (UK Mainland Only). ALL STEERING SYSTEMS MUST BE COMPLETELY DRAINED OF FLUID AND FLUSHED PRIOR TO FITMENT OF ANY PARTS. Steering Specialist Limited will not be held liable for any costs incurred during fitment, removal or operation of any parts. To return (or inform us to collect) your old unit if applicable. Any orders placed and paid for by 2.30pm Monday to Thursday will be dispatched for next day. Orders placed on Friday before 1.30pm will be dispatched for arrival the following Monday (UK Mainland Only). Our Garage - We have our own purpose built garage & a 10,000 Sq Ft Factory with onsite fitting available. Mon - Fri: 08.00 - 17.00. Sat: 08.00 - 12.00. You can send us a message by using the "Questions and answers" section towards the bottom of the page. The item "Renault Master 2010 onwards Power Steering Rack Repair / Remanufacturing Service" is in sale since Friday, June 9, 2017.